This is not a coal mine. A coal mine is where the coal is removed from the ground. Some tipples are built atop coal mines, with the coal going directly from the mine, to the tipple, and then into railroad cars. Other tipples, like this one, are built at a convenient place to load coal cars, with the coal being brought to the tipple by truck or conveyor belt from mines nearby &dash; this can be "just over the hill" but is sometimes several miles away. 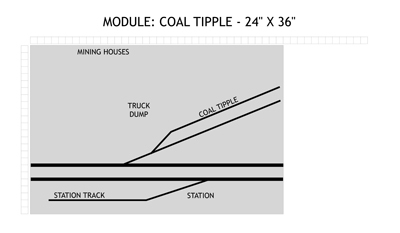 Whatever the source, coal is brought to the tipple, where a conveyor carries it to the top, allowing gravity to drop the coal down to the coal cars below. At some locations, cleaning and sorting of the coal is done on its way down. Slate and other rocks that are sometimes mixed with the coal will not burn, and need to be removed. In some places, coal is sorted by size, since different customers specify different grades of coal, depending on their needs. At the front of the module, a "public delivery" siding allows cars to be delivered to customers who do not have their own railroad siding. The cars must be unloaded onto trucks, so the cargo can be taken to its final destination. The recipient has a limited amount of time to unload the car, after which the railroad will charge a "per diem" (per day) charge for using the railroad car as a storage place. The coal tipple with Tunnel Hill in the background. 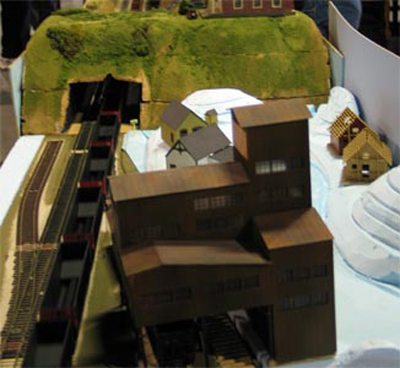 The coal tipple module with more complete scenery.